The International Launch Services (ILS) company is set to launch its Proton-M rocket on Friday, Jan. 29. The booster is being sent aloft to deliver the Eutelsat 9B communications satellite to orbit. Liftoff is scheduled to take place at 5:20 p.m. EST (22:20 GMT) from Launch Pad 39 at the Baikonur Cosmodrome in Kazakhstan. The launch was initially planned to take place on Jan. 25, but it was delayed due to weather-related logistical issues. Currently, the Proton-M booster is erected on the launch pad and is ready for the final processing before the scheduled liftoff. On Sunday, Jan. 24, the rocket was transferred from the processing and testing facility to the fueling area where the upper stage low-pressure tanks were filled. The next day, the technical specialists completed the assembly of the launch vehicle including the mechanical and electrical mating of the Proton-M booster with the ascent unit, consisting of the satellite, the adapter system, and Briz-M upper stage. Finally, the rocket was rolled out to the launch pad on Jan. 26. The Proton-M will use a standard ascent profile to place the Briz-M upper stage, together with the satellite, into a sub-orbital trajectory. Then, the upper stage will perform a series of planned maneuvers that will end with the injection of the spacecraft into a geosynchronous transfer orbit (GTO). The Eutelsat 9B satellite should then separate from the upper stage about 9 hours and 12 minutes after launch. Eutelsat 9B being loaded into the container that will make its way to Baïkonur Cosmodrome launch site. Photo Credit: Airbus Defence and Space. Eutelsat 9B, built by Airbus Defence and Space, is a high-capacity Ku-band communications satellite. Eutelsat is scheduled to operate this satellite for up to 15 years. The French-based aerospace firm has stated that the satellite was designed to address high-growth video markets in Europe. Eutelsat 9B should be able to do so by providing wide coverage for channels that require maximum reach into satellite homes and terrestrial headends. It is hoped that the satellite will be able to address high-growth linguistic digital TV markets in Italy, Germany, Greece, and the Nordic/Baltic regions. The satellite, weighing approximately 5.2 metric tons, is based on the Eurostar E3000 platform. This bus can accommodate over 100 transponders, a large number of antennas, and payload power requirements ranging from 4 kW all the way to 14 kW. 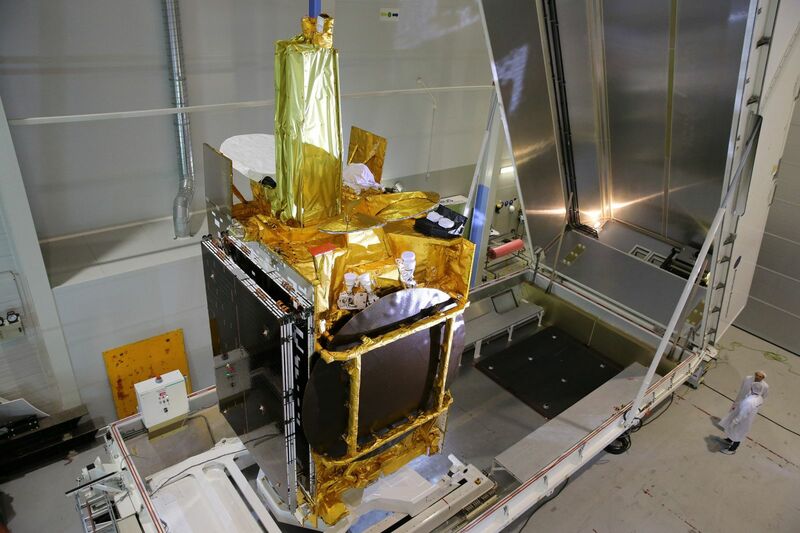 The Eutelsat 9B spacecraft features two deployable solar arrays and is fitted with 56 Ku-band transponders, connected to a broad European-wide beam and four regional beams over European countries. The first Eutelsat satellite, named Eutelsat I F-1, was launched on June 16, 1983, by an Ariane 1 rocket from Europe’s spaceport in Kourou, French Guiana. Eutelsat was established in 1977, and currently operates a fleet of some 39 satellites located in geosynchronous orbit between 116 degrees West and 172 degrees East. 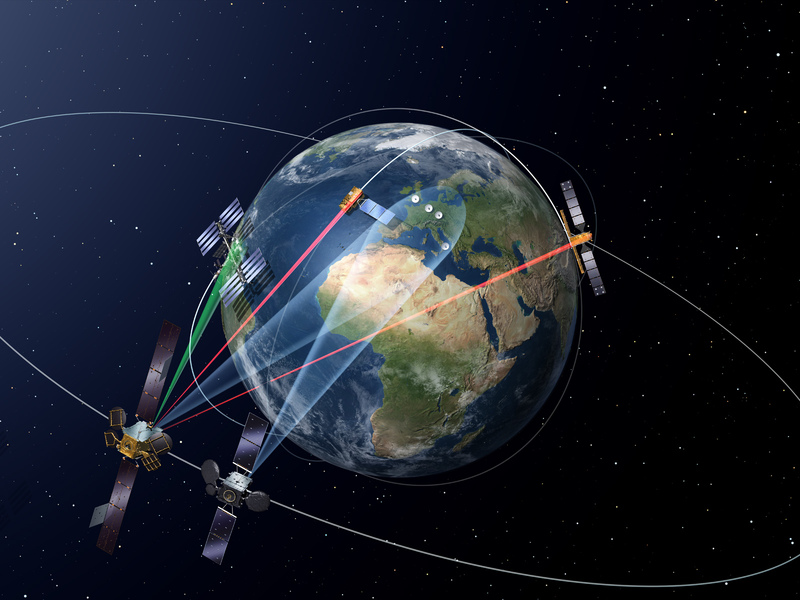 If everything goes according to plan, Eutelsat 9B will host the first data relay payload for the European Data Relay Satellite (EDRS) System being implemented through a Public/Private Partnership (PPP) between the European Space Agency and Airbus Defence and Space. Dubbed the “SpaceDataHighway”, EDRS should provide near-realtime Big Data relay services using cutting-edge laser technology. According to ESA, it will dramatically improve access to time-critical data, aiding disaster response by emergency services and maritime surveillance. The EDRS system of telecommunication satellites in geostationary orbit will allow very high data rate and bi-directional data relay communications between low-Earth orbit (LEO) Earth observation satellites and an associated ground station. The satellite that will be delivered into space together with Eutelsat 9B is designated EDRS-A and is the first of two spacecraft in this system. “The role of EDRS-A is to be a relay satellite for information like videos, images, and data collected by other sensors, taken by Earth observation satellite, drones and surveillance aircraft. The SpaceDataHighway satellites will establish high-speed laser communications with these platforms and retransmit [that] information to the ground in near real time,” Bruno Daffix, Head of the Communications, Intelligence and Security business at Airbus Defence and Space, told SpaceFlight Insider. The second EDRS satellite, designated EDRS-C, will be launched in 2017 atop another Ariane 5 rocket. When fully deployed, the system should be able to relay up to 50 terabytes of data from space to Earth every day. It will also be used by the International Space Station (ISS) to communicate with the ground, supporting its usual functions, such as live video transmissions or sending the results of experiments to the ground from Europe’s Columbus research module. The 190-foot tall (58-meter) Proton-M booster that will be used for Friday launch measures some 13.5 feet (4.1 meters) in diameter along its second and third stages, with a first stage that has a diameter of 24.3 feet (7.4 meters). The total overall height of the Proton booster’s three stages is 138.8 feet (42.3 meters). The rocket’s first stage consists of a central tank containing the oxidizer surrounded by six outboard fuel tanks. Each fuel tank also carries one of the six RD‑276 engines that provide power for the first stage. The cylindrical second stage is powered by three RD-0210 engines along with one RD‑0211 engine. Meanwhile, the third stage is powered by a single RD-0213 engine and a four-nozzle vernier engine. Guidance, navigation, and control of the Proton-M during operation of the first three stages is carried out by a triple redundant closed-loop digital avionics system mounted in the Proton’s third stage. The Briz-M is powered by a pump-fed gimbaled main engine. This stage is composed of a central core and an auxiliary propellant tank that is jettisoned in flight following the depletion of the stage’s propellant. The Briz-M control system includes an onboard computer, a three-axis gyro stabilized platform, and a navigation system. The quantity of propellant carried is dependent on specific mission requirements and is varied to maximize mission performance. Friday’s mission will be the first launch conducted by ILS in 2016. The next ILS flight is currently planned for April 23 when a Proton-M rocket is slated to lift off with the Intelsat 31 communications satellite. Absolutely beautiful launch vehicle! May the launch go perfectly and the satellite deployment, as well. Love the quality of the website and the videos. Thank you for sharing with the World.